Welcome to Harvest Monday, where we celebrate all things harvest related. Some of the overwintered kale in the greenhouse is starting to bolt. I harvested all the leaves off the lone plant of Western Front, plus several rapini that were coming on. I left the stalk of the plant to see if it will put up more flower shoots, which it starting doing practically the next day. I’ve really enjoyed eating the greenhouse kale, and it has given us a headstart on other spring greens. I still have some in the main garden to cut too. We still had lots of tender spinach in the refrigerator from last week’s harvest. Some of it went into a salad we had for lunch one day. We added hard boiled egg, walnuts and toasted whole wheat bread crumbs, and my wife whipped up a Meyer lemon vinaigrette for dressing. I also pulled the rest of the spinach from cold frame bed #4 last week to make room for lettuce. That spinach went into a sweet potato hash my wife cooked for dinner one night. It’s a simple treatment, just cubed sweet potato cooked in a little oil until tender and browned, then chopped spinach tossed in until wilted. It made a great side dish to some planked Sea Bass, which was lightly seasoned with homemade garlic powder and smoked Dulce Rojo paprika. I can see me making this hash with purple sweet potatoes and kale, or any other green for that matter. The asparagus seems to be coming on stronger now that the weather has warmed. We harvested six pounds in the first month, which is less than the nine pounds we got in the same period last year. But then we had a lot of cold weather in late March/early April, which slowed it down considerably. Time will tell if it does as well as last year’s 35 pound total, which was a lot of asparagus for the two of us! I stir fried some briefly last night along with mushrooms and garlic for a side dish. 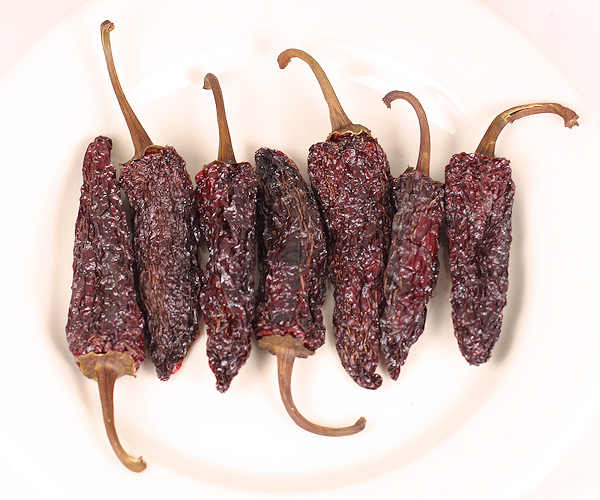 I took the last of my 2015 dried jalapenos and used them to make a batch of Chipotle Peppers in Adobo Sauce. I grew Tam ‘mild’ jalapenos last year, and they wound up being almost as hot as the regular ones, and got even hotter after smoking and drying. But they were great in this recipe, using some of my homemade tomato sauce as a base. I froze the chipotles and sauce in an ice cube tray, since I usually use it in small quantities. I am planning on cooking up some bean enchiladas later this week and I may throw a cube in the sauce to give it some smoky heat. The whole kitchen smelled heavenly while the sauce was cooking. Thanks to Erin (Shy Olive) for sharing the link to the recipe! And I’ll close with some future harvest news. The first tomato blooms are on a plant I started earlier than usual to grow in a container. It’s a variety called Spike from Artisan Seeds. Go tomatoes!!! It’s always a race here to see which tomato will be the first to get ripe, and Spike is definitely off to a good start. This entry was posted in Harvest Monday and tagged asparagus, chipotles, hash, kale, spinach, tomatoes. Bookmark the permalink. Your first tomato blooms already – how wonderful! And on such a little plant. And I’m still envious of your greens. Another few weeks and I should have my own though. Your meals always look delicious. There are few things I dislike but chipotle in adobo sauce is one of them. Now that I’ve read the recipe (or at least the version you used) I’m not sure why but I just don’t like the smell. I use dried jalapeno all the time so I assumed it was something in the sauce (rather than the pepper itself) that caused my dislike. It’s funny, my wife doesn’t like the smell of the smoked peppers but thought the adobo sauce smelled great. The homemade sauce tasted lots better than any I’ve had in a can. It reminded me of the difference between canned enchilada sauce and homemade – no comparison! We have never grown spinach as we didn’t think that we liked it. Recently we have enjoyed it in a vegetable biriyani and vegetable lasagne. Maybe the way it is cooked is the key of picking very young leaves. We may be tempted to grow our own. I would think you would have good luck with overwintering it like I do. And like everything else, I think the quality and flavor of homegrown spinach is better than store bought. Yippee – the first tomato blossoms! I just started my seeds this past weekend, so I guess you’ll be seeing your first ripe tomato weeks before I do 🙂 I also found the Tam Jalapenos to be as hot as regular ones. I’m trying them again this year and am hoping that watering the bed more thoroughly will help with that – but I guess a lot also depends on how hot we get this summer, which is up to Mother Nature. The sweet potato hash looks delicious! I’d add a dash of cayenne pepper or chili powder and call it the main event. Thanks for the idea. Your asparagus looks beautiful. Such a spring treat. I’m afraid I have no harvest to share, again, but I love to see what you’re cooking up Dave! I wish I had 35 pounds of Asparagus to play with… I wonder what asparagus with Chipotle / Adobo sauce is like? Too overpowering, do you think? I am thinking the sauce would make for some spicy asparagus! My wife can’t eat hot or spicy foods, so I will have to use it for things I make for myself. I wish everyone had lots of asparagus too! We’re still waiting for our first-year asparagus to pop up. Hopefully soon. Your asparagus dish looks super appetising. The sweet potato and spinach – yum! And that’s an early tomato flower….My plants are doing well but no flowers. I haven’t written a harvest Monday post this week…. I did find a few carrots when I was weeding a bed and had some more lovely over-wintered salad from the farm I volunteered at again, but for some reason didn’t take any pics. Anyway, hopefully will be back next time 🙂 have a good week. My overwintered spinach has been a real disappointment this year, leaves are browned. Ouch on the computer troubles! Been there, done that for sure. Ah, that Sweet Potato hash looks wonderful. Another hit from the Our Happy Acres kitchen! And that Adobo sauce looks really eat too. I love spicy things and learning from you how to use peppers in the kitchen in creative ways. Good luck on the tomato! You are well on your way to being the first on your block- or county -or state- with the first tomato of the year!